I commend many of you for the concern you have shown me in regard to the plight I am undergoing.I have told you before that I am about to be convicted and pushed to Luzira on trumped up charges of assault and threatening violence. On 21st January, just a week ago, I went to Kampala City Hall court expecting to have the ruling for threatening violence read to me. However, the Magistrate told me that the ruling would be read for me tomorrow on Friday 29 January 2010. Shockingly, I was told by a certain Lawyer that the Magistrate was set to convict me for assault. The Lawyer himself knows that the charges are politically motivated and the State has now realised that the only means through which I can be stopped from sharing my ideas with the masses is by having me maliciously convicted. I never assaulted a police woman; I was arrested by five police officers with two guns; I was beaten terribly and deprived of my money; I was denied police bond allegedly on the orders of the Inspector General of Police Kale Kayihura; I have attempted seeing Gen Kayihura and it has been Impossible; my case against the Attorney General and Dr Onen was dismissed on 28 August 2009 and to date no ground for its dismissal has been told to me. I have been pushed against the wall so much so that I am tempted some times to do something bad. But on second thought I realise that I shouldn’t drink from the cup of bitterness. I know the NRM gurus might think that they can torture me incessantly and ultimately kill me but for sure, the people of Bushenyi and all the people that know me in and outside Uganda will never forget although some may reluctantly forgive them. First, it is very clear that in criminal charges, the burden of proof lies with the prosecution and the degree of proof must be beyond reasonable doubt. Whoever could have attended the hearing of my cases must know quite well that if our justice system was fair, the so-called state witnesses should have been arrested for they were committing an offence of perjury. I remember the Magistrate himself telling the State Attorney, thus “State, your witness is more of a dramatist than a witness”. I have said before that I expect no justice in Museveni’s judiciary but what pains me so much is the silence of the Ugandan human rights defenders who know pretty well my ordeal and have done nothing to come to my rescue. I wonder whether the label human rights defenders continues being relevant if they cannot stand by the helpless like me. If I would borrow from Martin Luther King Jr, at last we shall not remember the oppression of our enemies but the silence of our friends. It is on this ground that I call upon the friends to the human rights defenders to break their silence. I wouldn’t mind being convicted if I was guilty. I wouldn’t even fear being jailed in Luzira if I was a criminal. But the truth of the matter is that the government is using that as a strategy to kill me for they know that it will be quite easy to poison me or to take me to a prison farm where they can shoot me and say, I was attempting to escape. I opposed the increment of fees up to 126% and I still oppose it. I strongly believe that any functional state must be able to provide education, health services and infrastructure to its citizens. I still oppose the new fees structures in Makerere University. And I have argued before that Museveni’s government must fund public educational institutions and subsidise private educational institutions because people trained therein are not private people but citizens who will immensely contribute to national development. In fact, as the semester opens next week, year one students in Makerere will do whatever is possible to make sure that the sudden, unprecedented and heartless fees increment aimed at making us the sons and daughters of the peasants fail to study is reversed. The government has money that has always been wasted in statehouse. I know of Museveni’s advisers and ministers’ children studying on statehouse scholarship. Are we slaves in our country that we must be exploited and live under slavery and servitude? If Museveni and his people have realized that leadership is complicated let them pave way for us the young blood to take over from them. I have argued before that Museveni of 1986 is fundamentally different from the Museveni of 2010. We must liberate ourselves from the predatory Museveni and destructive NRM. I beg that in case I die, all my views that I have documented be published in black and white so that our descendants learnt what I stood for and what I died for. I am not at all inclined to sell my conscience. I will not sell my country at a price; I will not sell my cherished values. People that have tremendously made a contribution in society never died as rich men. Jesus Christ whom majority of us worship daily was died a poor man materially but mentally and morally very rich. I prefer material poverty to moral and mental poverty which many of our politicians are suffering from. I would rather die for a genuine cause than live in subjugation and under oppression. There has been a misconception that all westerners are benefitting from Museveni. Never has this ever been true! The beneficiaries in the Museveni’s regime are a few people from his Hima sub-ethnic group and his old boys at Ntare and Dar-Es-Salaam. This is not how the state should be run. I know many people will argue that everyone is sectarian in a way. Possibly, the mistake Uganda made is to accept a person who never studied from Makerere to be president because then he had very few Ugandan friends. But also, that argument may not be tenable because Mwalimu Nyerere, Benjamin Mkapa and Mwai Kibaki never studied from their countries for university degrees. Thus, one can argue that Museveni’s sectarianism and myopia are intrinsically and inherently rooted in him as a person. There are people who have accused me of not respecting the president because he is a fountain of honour. They are wrong. The president is a fountain of honour only and only when he comports himself in an honourable manner. Ugandans deserve better. I have written to the president complaining about corruption and grave human rights violations but the reward I have got instead has been illegal arrests; detentions without trial; incommunicado detentions and a reminder that this country has owners. Assuming Museveni owned Uganda, does he also own my grandfather’s land in which I stay? Does he also own my bank account from which I draw money to foot my bills? This is a litmus test to all the opposition members who encourage Ugandans to stand up and challenge their leaders. If none can standby me then it will be difficult for very many youngmen and women to stand to be counted. Hence, the opposition can as well forget about the 2011 election and count it a fait accompli. To those who share with me my ordeal I only appeal to you to extend a helping hand through offering me legal aid and financial support. I strongly believe that I stand for the noblest cause which shouldn’t die anyhow. Should I be convicted tomorrow, it might be the last time you hear about me for I have clearly learnt that the NRM’s intention is to sacrifice me as a martyr. I have learnt this from a top ranking UPDF officer who told me of a new spy unit called the “Dirty Tricks Unit.” I was told that the Dirty Tricks Unit follows their targets wherever they go and that they even use their spouses or their landlords. If they fail to find any dent on you, they will economically incapacitate you and make life impossible for you. This is exactly what they have done. District about Dictatorship of NRM in Uganda were all put in Prison. Among others include Mr.Mondia and others, These are people who bring to our understanding of justice in the district. How does president Barack Obama convince the world that he still has the reigns of power? Amidst all the voter anger and terrible turn out of events in a safely democratic state like Massachusetts, buttressed by town hall meetings soured by Rush Limbaughites and tea party spoilers alike, led by a republican leadership that has turned a deaf ear on anything that comes out of his mouth; President Barack Obama, has a non-enviable task of dispelling a growing global perception that he is being rejected by many in America for reasons unknown to him. There are some in the black community who opine that he needs to come out tonight and appeal to the American people by uttering the words of a wise slain civil rights leader Martin Luther King, that just as he resisted taking the lower road of polarization in his race to the white house; so should they resist the temptation of falling on the wrong side of history in this 21st century. He should ask them to judge him just by “the content of his character and nothing else” and that is the change he had called for in his campaign. He needs to look his people in the eyes and tell them that he is being portrayed by the far right in an unfair manner, much as he has tried as hard to embrace a higher moral route-the hatred talk is obviously a galvanizing force in the country, providing to pollsters the widest margins of polarization ever in the history of the nation. It appears increasingly that no matter what he does, the folks who don’t like him, have neither patience nor intent of letting him enjoy any legislative successes or even allow him to run for a second term. Convincing the rest of the world that he does not carry the stigma of “tokenism”, has been a pre-occupation of the president for the entire year; even when things looked so blatantly ripe for such a definition to a growing number of black folks the world over. Much as many understand that corporate America and its quest for perfection, has a habitual tendency of being a place of violence for many Americans, as witnessed in last Sunday’s CBS 60 minutes program. The demand for quality is so overwhelming that grown ups have to yell at each other to meet that leading edge-and CEOs including the president are not held above that foray. However, there are some among us who are riding an imaginary chariot without realizing that we will all suffer because of in action or the formation of frictional forces arrayed against the president to create gridlock during this period of financial crisis. The time for leaning on bankers to offer real solutions to home owners and other customers to remove any disillusions is now; otherwise a federal clearing house type of bank is necessary to bail out troubled debtors. The task to create employment has to be a national task led by local business leaders, mayors and governors of all states. Dropping the healthcare debate is not the solution either, but leaning on his party to remove all the unnecessary traps (pork barrels) that have been laid in the bill-is what the American people want him to do. They want him to lead the pack by prudently offering a tinge of fiscal conservatism where applicable, absence of this type of governance is what they are calling him on the carpet for. Have you forgotten that he was the one who led a government delegation to Bilerus? He was Chief (not mere director) of Chieftainancy (not directorate) of Logistics and Engenneering in UPDF. His companion had imported one side shoes under under sized uniforms form China. They now call themselves Mr.. and Mrs. Clean. Ugandans are not gullible.From Bilerus, we got junk helicopters. 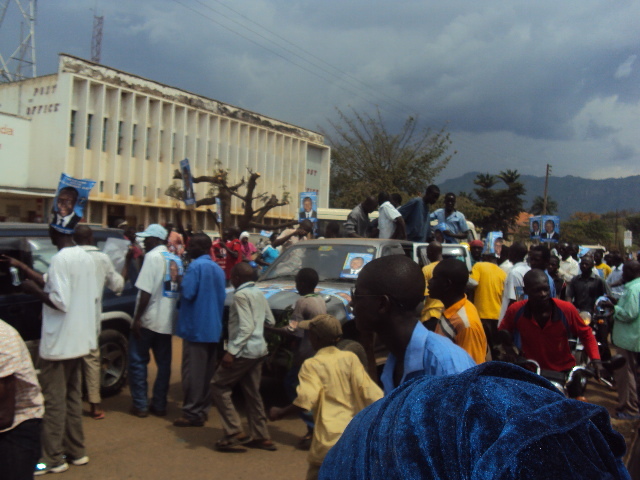 Besigye led the government delegation. Do we have justice in Uganda? On Thursday 21, January 2010, the hearing of my case was closed. The Magistrate handling my case then told me that he would deliver the ruling for the two counts – threatening violence and assault on Friday 29, 2010. I was later told by some lawyer that the Magistrate told him that he is going to convict me for assault. Whoever might have attended the hearing must know quite well that there was no substance in the charges against me. The witnesses that were lined up didn’t even know exactly what they were talking about. But of course, I cannot be surprised if I am convicted because that is the price some of us must pay for consistently opposing injustice. I am terribly shocked that the goons who claim they fought a bush war to liberate us have now chosen to turn against any critical voice. I have decried patronage, corruption, denial of opportunities to the peasants’ children, wanton abuse of human rights etc. Every thing I have done, I use my pen and my tongue and a lot of what I have done is documented in black and white. I have shared with you that I have for so many times been tortured; deprived of my money and have had a lot of my property stolen by the police. Shockingly, I recently was told that the case I filed against the state in May last year was dismissed on 28 August 2009. No grounds for its dismissal have been given to me. Ar we living in a state of nature? If Museveni’s government feels the only means through which they can correct their mistakes is dumping me in jail on trumped up charges, let them go ahead. Nonetheless, I have now learnt of the Dirty Tricks Unit (DTU), which the NRM uses to follow us up and make life impossible for those of us that need a better Uganda. Jesus Christ our saviour also shed his blood and died for us when hewas innocent. I thought with the death of Jesus, none else should be innocently sacrificed. However, I have now learnt that Uganda’s dictators are ready to sacrifice anybody that stands in their way. I call upon all caring Ugandans to be concerned about my plight. As for my brothers and Sisters in Bushenyi, none of you should keep silent in case I am sent to Luzira because I have learnt that all they need is to poison me through food or inject me with poisonous drugs. I strongly believe that I don’t have to die because I opposed sudden and huge increment of fees up to 126%. I expect only fools and opportunists to vote Museveni come 2011. Otherwise whoever loves Uganda cannot waste their vote giving it to the man who has manipulated and deceived us for close to three decades. Shouldn’t you read anything from me, know that I have been convicted in which case I may not stay safe! Since I know that you are a member of this forum, I am going to use the resources of UAH to convey my few thoughts to you and your office regarding the situation we have in Uganda and specifically Kampala. Being a leader of opposition puts an enormous task on your shoulder for you have to build the picture of the government you want to build in Uganda, but you must as well be careful in the manner you structure it so that you come out as a different person from the government you oppose. With that in mind, I have listened to your comments when you went to visit the women that were arrested and I could not help but wonder if you took a time to think through what you stated, and here is the tape I am referring to. http://www.youtube.com/watch?v=IvUiASsGPOQ&NR=1 In that tape you made a statement that you are working for peace and you have no reason to be afraid of Uganda Police, for you are have broken no law, you continue to state that it is the Police that breaks the law. And that is a very disturbing statement especially when it comes from a leader of opposition, a very reason I have decided to raise it in this late Uganda night hour. You are a leader of opposition, that means that you believe in a structure that is in Uganda, it also means that you believe that Uganda has a government as an institution, for if you did not believe in the institution of the government, you would have stood in front of Ugandans and denounced leading a political party. And among those units that create the Uganda government institution is Uganda Police. And we can have a discussion as Ugandans of how effective or non effective is Uganda Police, and we can debate how efficient they are or not but as a Ugandan listening to my leader of opposition, a man I expect to lead the next government, I get very afraid when I hear you stating and in public that Uganda Police is a pile of law breakers. The best you would have done if you know that there is a problem in Uganda police is to use the system we have in Uganda which is to go through the ministry of internal affairs or through the parliamentary system to clean up this organization. I simply get very afraid when you stand in front of a micro phone make such an accusation against the entire Police force, when they have no chance to defend themselves. I wonder also if you have done a thorough study to reach a conclusion that the entire Uganda Police Force is full of criminals, these are way too many officers that put on that uniform, if you are to make such a statement you need to provide the back ground on how you have come to that conclusion, and what steps you have taken to clean up the Police Force. But even so, one would have expected you to use a different method of communication, for militarism has been tried in Uganda for ion years and it has simply failed. And here is the danger in your words, you isolated the entire Police Force from the state, and you personalized it as a personal force. And as a Ugandan that is where I question your agenda, what will you do suppose you are elected to power come next election? Are you going to fire the entire Police Force or you will work with it and build it? Is it a stand of FDC as a party that Uganda Police is a pile of criminals or it is your personal stand? If that is the stand of the party that is fine then stand up and make a public statement towards that. And it is in the right of FDC to stand up and state that you do not believe in the Police Force we have in Uganda, and after you come to power you will fire it. But do not make such ambiguous statements which makes your leadership qualities questionable. Since the Luwero war, a whole lot has gone very wrong in our country there is no debate about that. And much of that wrong has been built by we the Ugandans, so Uganda Police can’t simply be free from those wrongs, but I take a very bad breath when you our leaders and prospective leaders especially the leader of opposition, when he stands up and declare the entire national force to be a bunch of criminals. I have spent a time in Uganda and hard as life is, there are some very committed Police Officers in Uganda, the men and women that work day and night to see a better country but men and women that have been so screwed up by decisions you their leaders make. And of all people you should have understood this. And you stand up and use a camera to call all of them a bunch of criminals. 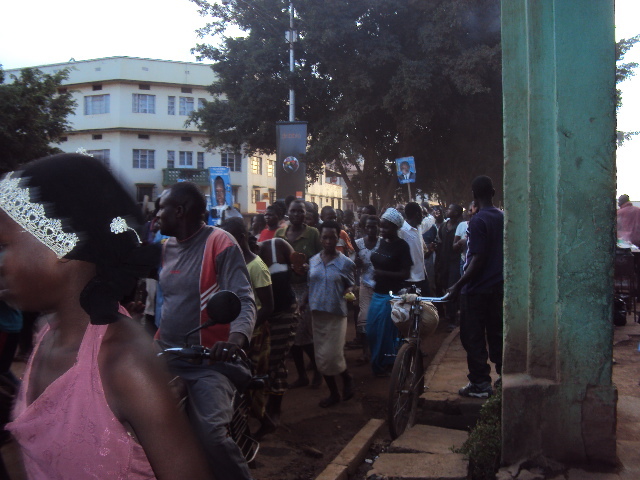 Dr Besigye, it is these kinds of language that boils our population to the recent Kampala riots. If you call the Police force a pile of law breakers, why is it so wrong for a Ugandan to target them and kill them? But why should our children respect them? I hope you think about my concern so that we as Ugandans start to build a sense of calmness and law abiding, and this all starts with you as a leader of opposition choosing your words very carefully especially towards the men and women that serve that country. And if FDC does not feel that Uganda Police is important then use the right channel which is the parliament of Uganda and pass a law to ban them straight out. If I was a Police Officer in Uganda today, I would hand in my badge, for I fail to see how I can function when a leader of opposition uses such a very irresponsible language. And irresponsible in every manner and form. And if Uganda Police is not wanted by FDC can you kindly list any or all other government institutions that FDC will not protect. It is very interesting if we are moving from the movement language to this kind of language. I was equally inspired and saw some of the very women arrested in Kampala here in Mbale yesterday escorting their Mbale Municipality FDC Flag Bearer in the MP Bye-election. Though not seen but attached are some various nomination pictures. FDC Candidate is Mr. Jack Wamayi Wamanga and the one in yellow is Dr. Mutende James an NRMO Independent as I missed the rest due to rain. Now a question lingers in the minds of responsible people here whether the two camps want the usual Presidential intervention or handshake or resource envelope etc as he comes or truely in the race to the end given the fact that the FDC Candidate is equally a strong Candidate who began his ground work months ago. I did some survey and came across many NRM diehards disappointed at their primaries and determined to celebrate should the FDC man win!!! Watch this space as updates flock and iam sorry to have delayed your reply. 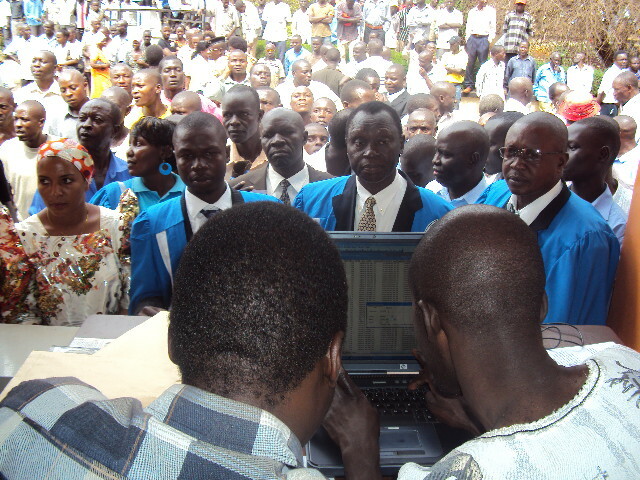 a reports and commentary have either deliberately or unknowingly steered clear of Janat Mukwaya’s reputation in Mukono South. They have instead, in typical fashion, chosen to applaud her on an involuntary decision to quit – which by the way us lot in Mukono South already new about. Not because Mukwaya told us BUT because the writing was written on the wall. Seeking re-election in the face of an imminent loss would not only have resulted in disaster for this veteran minister and former bush fighter but also a telling commentary on the friable state of the Museveni government – a gigantic edifice of repression, corruption, ineptitude and malfunction. People here are so fed up, like no other in this country, of their MP. Mukwaya’s reputation in this, my home constituency, had fallen like a sack of hammers that there was no way back if she dared seek re-election. A look at the previous two elections would certainly tell you why. In the election before the last, she had her nose rubbed in mud by Wasswa Kanakulya, only the latter to be stripped of the seat as his academic qualifications were later found not to fit the bill; a misfortune that meant Mukwaya was in to share the spoils. We all know how she was vehemently wrestled in the most recent election. This woman, I respect for her services to constituency and country, had no other option than to quit politics to avoid getting battered in 2011 and no amount of her trademark intimidation and all sorts of election malpractices would have stopped the people of Mukono South to unleash punishment. Oh yes! Mukwaya – like Museveni – is incapable of winning a free and fair election. Particularly the last two elections have been marred in Mukwaya engineered intimidation/threats (and some times, low key violence), and coercion of voters or her opponents. Most of these things have gone unreported by the mainstream media BUT the are all too common here. Her departure brings a sense of relief BUT it is not the end of coercion here. Now there is talk of NRM fronting, in 2011, Mrs Sekiziyivu, a woman without any known close ties with Mukono South, although she occupies the district’s women’s seat and lives in Mukono North – migrated here from Kiboga where she was Woman MP, (1992-1996). NRM peer, Bakaluba Mukasa, the man who was at the heart of rigging in the disputed Mukono North election rambles on; may also have a last ditch effort here, in Mukono South, as Nambooze makes Mukono North a no-go zone not for him in 2011. That is not to say we do not have home-grown talent here who may throw their hat in the ring. I am not so sure whether there are any NRM votes left here. Mr Museveni was here recently and the locals largely snubbed his visit; and it easy to see why most of them stayed away. There is genuine and ever-growing resentment in this resilient corner of arguably the most dynamic district in the country. The president’s continued cajoling of support out of voters here (on promises – which we have heard before in previous campaigns – of the laying of Mukono-Katosi road) has so far fallen on deaf ears. 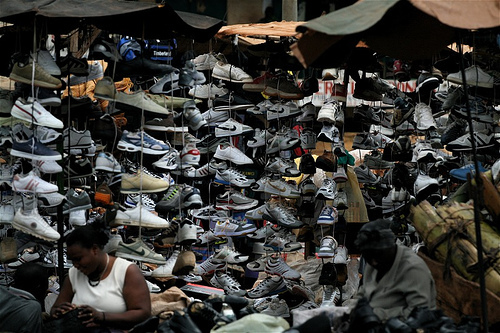 What they did painfully note though was his belittling remark, during his ‘Bonna Bagagawale’ promotional tour, that he didn’t understand “why people ask for power and tarmac roads when they have no incomes”…adding that “you first buy the shoes you will use to walk on the tarmac”. The roads here – all loosely surfaced – are despicably potholed, dusty, largely impassable and accident hotspots in most parts of the year. 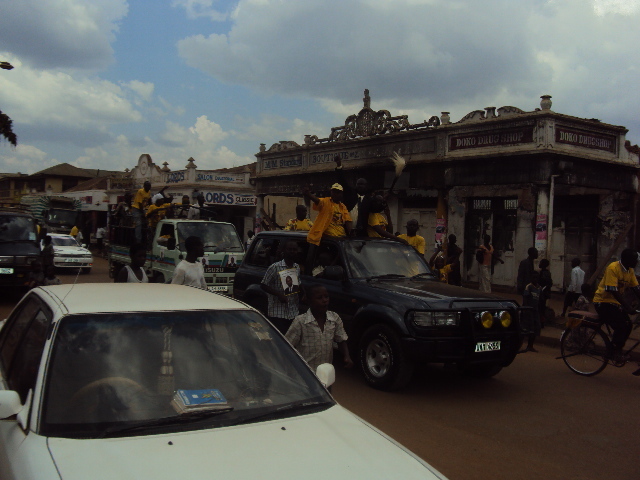 Whatever happens, anyway, the sun will shine on a Mukono South election 2011 without Mukwaya. 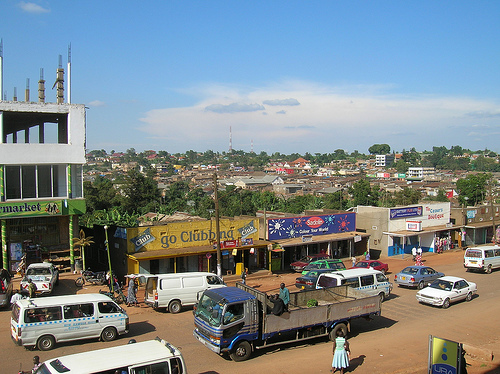 Kalule Mbowa is a native of resident of Mukono South – Lived and schooled here and will probably die here. Ido respect people’s opinion to build a united Uganda that trascends all ethenic differences. The biggest haddle that has prevented this to happen is the methodology. When ever you build a house you must have a strong foundation,the foundation in this situation is the constituion and this should be made up of avery strong mix of cemment,sand and aggregate. the equivalent of the latter are views that were collected from a cross section of Ugandans.It is this cement to be used in uniting or forming strong bonds between the bricks that simblize the different tribes of Uganda in there natural settings without disturbing inner settings called culture, envetualy this becomes a. Strong wall called unity. Un fortunately this is constantly changed by opportunistic politicians that I would comnfertably refer to as,” the engineer Kamyufus”.These guys are always there to paddle there personal intrest,we have witnessed numerous times our constitution has been changed from its original political engineering design.What we have now is a fake mortar that has wrong mix it cannot cause unity or strong bonds that will keep Uganda together.One would rigthly ask that what can we we do?The ans is 2011 is a round the cornner,the site is not levelled to make our job easy,we know the companies that a bidding for the job of reconstructing Uganda to fulfil our dream of One nation with all its people equal and loving and we also know the company that has destroyed this dream.